i3 Fingerprint Readers are constructed for operation in most environments. Equipped with a 10-print device, the i3 Fingerprint Readers are manufactured to capture forensic quality fingerprints. 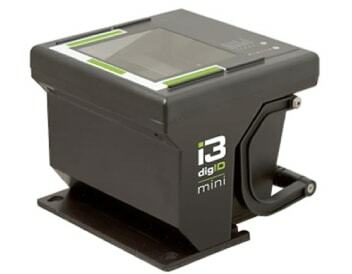 The i3 product is the industry’s first USB powered complete Live Scan fingerprint capture device. The i3 fingerprint reader is constructed to operate under harsh conditions while also being compact and portable. If you are need of complete Live Scan system or replacing an older device, i3 offers a suite of solutions that allow you to capture 10-print FBI quality fingerprints quickly and accurately. ​An auto-calibration mechanism ensures the device maintains FBI quality standards in a transparent manner. When coupled with i3’s inVize ID, sequence checking, handedness detection, hand orientation and several image quality metrics enhance the ability to capture optimal scans every time. The digID Mini can go with you anywhere. It’s compact and light format complement its ability to provide complete functionality via our patented single cable connection to the laptop - no need for a power connection to the wall. A complete portable system includes a laptop, digID Mini device and application software all of which can easily fit in a wheeled travel case that fits under your airplane seat. inVize ID is a fully featured fingerprint background check application that captures fingerprint scans, collects demographic data and submits the data to the appropriate background check authority. inVize ID works for both applicant and criminal applications. It features a simple, intuitive interface that makes scanning and data entry easy even for a firsttime operator. Many advanced features and configurations exist for the power user as well.